18 inches long, 14 inches high. Braided strap is 19 inches long, and strap drop is 11 inches. Fringe detail on front and sides. The Camel Calf Suede has a Carmel satin interior lining. 1 8 inch interior zipper pocket. Double magnetic snap closure with fold over flap that clicks onto a ring. Gunmetal, silver and gold studs. We stock the Calf Suede in Camel & Black. Special Custom Order this bag Now! The Camel Suede color has been featured in the press, and our personal favorites are the Beautiful JJ Camel, Black & Army Green Calf Suede. In Leather this special JJ Winters Classic Desing is absolutely stunning in Brown Distressed Leather and Black Distressed Leather. 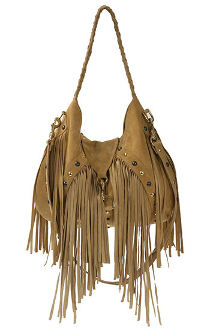 You can Special Custom Pre-Orders this bag which is available in many lovely JJ Winters Suede and Leather colors, Please allow approximately 3 or 4 weeks. Contact us for details.